This criterion is applied so that cross section of the cable can carry the required load current continuously at the designed ambient temperature and laying condition. Ampacity is defined as the current in amperes a conductor can carry continuously under the conditions of surrounding medium in which the cables are installed. An ampacity study is the calculation of the temperature rise of the conductor in a cable system under steady-state conditions. Cable ampacity, if required to be calculated than it is calculated as per the following equation givenin IEEE -399, section 13. R’ca – effective total thermal resistance of path between conductor and surrounding ambient to include the effects of load factor, shield/sheath losses, metallic conduit losses, effects of multiple conductors in the same duct etc (thermal- Ωft, ºC-cm/W). 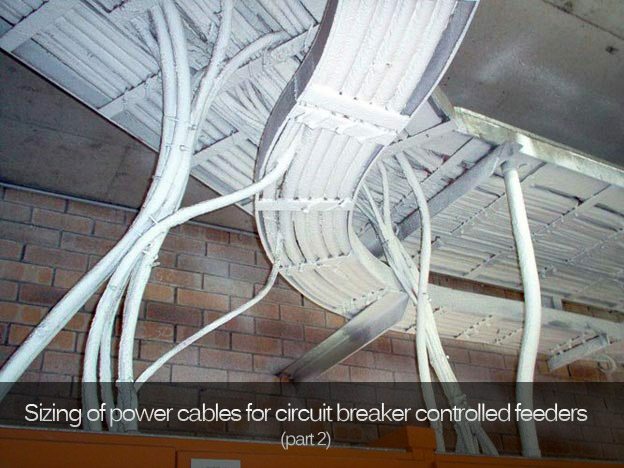 Grouping and proximity to other loaded cables, heatsources etc. However please note that while sizing a power cable we never calculate the ampacity. The above equation is used to analyze the cable ampacities of unique installations. Standard ampacity tables are available for a variety of cable types and cable installation methods and can be used for determining the current carrying capacity of a cable for a particular application. These standards provide tabulated ampacity data in manufacturers catalog for cables installed in air, in ductbank, directly buried or in trays for a particular set ofconditions clearly defined. It is because of this reason that we need to give the reference of manufacturers catalog from where the ampacity values are picked up. Now once the current carrying capacity of a cable is found from standard catalog; we convert that rated capacity (Ampacity) into actual laying condition. The standard current ratings for cables are modified by the application of suitable multiplying factors to account for the actual installation conditions. Hence we define one more term here called ampacity deration factor. K1= Variation in ambient air temperature for cables laid in air / ground temperature for cables laid underground. K2 = Cable laying arrangement. K3 = Depth of laying for cables laid direct in ground. K4 = Variation in thermal resistivity of soil. Ampacity Deration factor = Product of applicable multiplying factors among 1 to 4 listed above. Now from where do we get these multiplying factors to find the overall ampacity deration factor? Againwe get these values from manufacturers catalog because manufacturer of the cable is in best position to conduct thepractical experiments and test on the cables and find the percentage/fractional decrease in current carrying capacity of the cable in various conditions. For better understanding of the ampacity deration factor the following pictorial representation is provided below. Table for ampacity deration factor along with pictorial representation is provided below. However readers to note that ampacity deration factor table provided in this article is to verified from the manufacturers catalog which is intended to be used for project. Now let us apply the ampacity criteria for sizing the cable of a motor. The minimum required size as per criteria-1 is already determined in part-1 of this article. Now K x Cable Ampacity should be greater than or equal to the required load current. Applying ampacity deration factor = 461 * 0.623 = 287.203 Amperes which is greater than required load current of 275.6 Amperes. Hence cable size selected on the basis of continuous current requirement is single run of 3C x 300 Sq mm, Aluminum, XLPE. A motor rated 160kW controlled by air circuit breaker fed from main PCC of fault rating 50kA and connected through Aluminum XLPE cable requires a cable size of 3C x 240 Sq mm minimum because of short circuit rating, however selected size because of continuous current requirement is 3c x 300 Sq mm. The third and final criteria of voltage drop will be discussed in part-3 of this article. Thanks for the articles! Very useful! Btw why do you use 3 cable rack and 6 cable/rack at the calculating stage of K the factor? Is it just because for the example? Is it possible to just add one separated cable rack for the 3c x 300 Sq cable? Hello, I have some questions about Neher-MCgrath Method. Do you know if I can learn about it in a book? Can you recomend a book to learn about neher mcgrath? I like the explanation & looking forward for part 3 ie voltage drop calculation regarding. Good job Asif…. it is a step-by-step comprehensive explanation. I recommend the readers to down load excell calculation sheet made by jignesh.parmar. Good suggestion Ivan! 3rd part of Asif’s technical article is on the way, it will be published in the matter of days. I must say I’m quite surprised with depth of explanation in all three parts of article. Goog job Asif!